OTPPAY is an “Omni Token Platform for Payments”, the Blockchain powered Wallet (Buy | Sell | Exchange & Pay). OTPPAY will be the world’s largest platform in which all major crypto assets can be bought, traded and even make payments to the merchants at low fees instantly or escrow based. The pain point of crypto to fiat conversion by the merchant is bridged. Yes, trough our innovative artificial intelligence and machine learning based order/transaction matching engines will convert any cryptocurrency to OTPPAY tokens and OTPPAY tokens to fiat currency just in time. OTPPAY is a unique payment platform, which will have a way to use their favourite cryptocurrency in order to pay the vendors/merchants instantly. We provide vendors with the safety and convenience of receiving funds in fiat currency. One can even change the primary payment option from any cryptocurrency to OTPPAY tokens or fiat currency instantly, thus by protecting them from cryptocurrency market volatility. Our OTPPAY security system will be designed with the blend of traditional fiat currency security standards and latest blockchain technology. We will be acting as the catalyst to enable the just in time cross-border e-commerce and business transactions which will reduce the dependency of forex mediums. Our solution will disrupt the forex/cross-border financial market instantly. Our API’s will interact with the global eKYC interfaces and hyper ledgers to avoid the anti-social transactions. Our omnipresence data mining infrastructure will help us to build the proprietary negative database of suspicious transactions and block them in future thus by saving crypto-miners time & money. In near future, our AI-powered smart engines will be used to frame Crypto Credit Rating (CCR) system, by which merchants & users will be benefited from the OTPPAY Lend features. 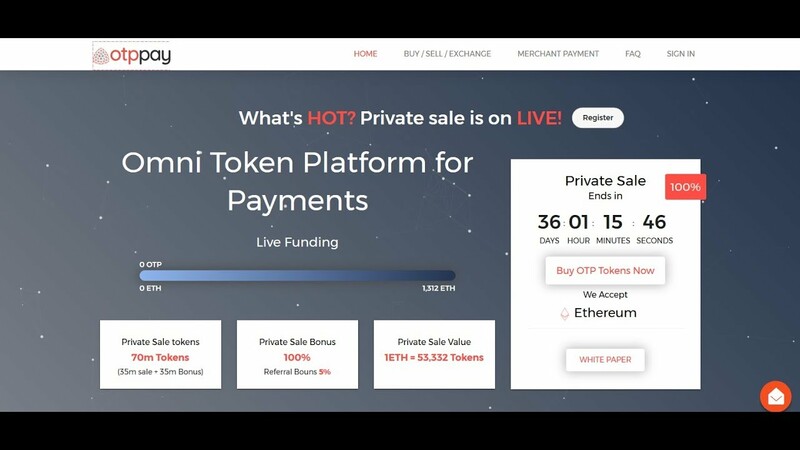 OTPPAY: OMNI token platform for Payments, we thrive to bridge the gap between Crypto and Fiat Payments. What is your Public ICO name? How to register with OTPPAY? Please refer the registration steps here. Smart contracts are computer protocols that automatically, verify, facilitate and enforce the performance of the contract in question. An ERC20 token is a unit of account on the blockchain called Ethereum which is an open-source, public, blockchain-based computing platform with smart contract functionality. We use Ethereum to distribute our own ERC20 Token called OTP. Which wallets can be used to store OTP? OTP is an ERC20 token and can be stored in ERC20 compatible wallets. You can use a MyEtherWallet.com, for an example. When will OTP tokens be available in my wallet? Token will be available immediately in your wallet. How many tokens will be sold? In ICO sale 600 Million tokens will be sold along with 111 Million tokens of Bonus & Rewards. How do I participate in OTPPAY Pre-Sale/ICO? When does OTPPAY ICO-Stage 1 Start? The ICO-Stage 1 will start from April 4th, 2018. How many OTP do I get for 1 ETH? Note: 5% referral bonus for all participants. Are OTP tokens ERC-20 compatible? Yes, OTP tokens are based on the Etherium platform and are ERC20-compliant. Can I send ETH and other Cryptocurrencies from an Exchange to participate on the ICO? No, you can't send contributions from any place except your wallet, as you will not receive the tokens correctly, and, most probably, will lose them and your funds forever. Is the token going to be available on Cryptocurrency Exchanges? It will be burned. No extra tokens will be available for sales after ICO. If anyone interested to hold OTP tokens they can obtain from our partner exchanges.